Blog from Hanoi, Vietnam | Sam and Leos adventure in Asia..
We have moved on a fair bit since my last entry- we left Thailand for Laos on an epic 3 day trip.First day was from Chang Mai to Chang kong (the border crossing) by bus. We crossed the boarder via boat into Laos and spent the night at the border town. We then took a boat down the river for 2 days (stopping off at night at a small village to sleep). It was a really nice way to travel as most people on the boad were traveling and we all sat around on the floor playing cards, reading books and admiring the amazing views. We met some really nice people on the boat who we have seen all over since. At the end of the slow boat ride was Luang Prabang where we stayed a couple of night in a hostel called Spicy Lao with Emily, Alex, Joe (we met on the slow boat) and Donna who we had been traveling with since our first full day. We went to the most amazing set of waterfalls I have ever seen- even on telly. They were so beautiful, after climbing to the top of them and admiring the view we swam in them for ages because the water was so clear and very refreshing in the heat! We saw another temple and just clilled out with the others in our hostel drinking for the rest of the time there- we did visit a Lao disco one night (which sounded like a good idea at the time)- it was so funny, a big room with the most random music blaring out and a bunch of lao people standing around huge oil drums as tables! They then all prodeded to drive home on their scooters! We played safe and waited for them all to clear the roads before getting a tuktuk (sort of bike powered taxi thing) back to our hostel. From Luang Parbang we went to Vang Vieng by mini bus- on the map this journey looks like 2 hours MAX but in fact it took us about 7 as Laos is just mountain after mountain- and it takes ages to drive anywhere. Vang Vieng is home to tubing- this is where you float down a river on rubber rings and there are load of bars at the side and guys throw roaps out to you and you grab hold, they drag you in and you stop off for a drink. There were also loads of tree swings into the river, vollyball, mud vollyball, mud tug of war etc etc.. we did this 3 days in a row followed by nights out which pretty much finished us off so we moved on hoping we would be able to get some sleep. Next stop is Hanoi (where we are at the moment) it took us a 28 hour bus ride to get here but it wasnt too bad as we had a sleeper bus and as long as the driver left the air con on was alctually ok and it gave me a chance to catch up on a little sleep. A lot of people moaned about the bus as the seats/beds are designed for the average South East asian who isnt vert tall (but this didnt really affect me). Hanoi is sooooo hot- much warmer than the other places we have visited but alll the accomodation here has air con so its not tooo bad, Today we wondered about the city and went to the vietnam history museum and the vietnam revolution museum (it was interesting but sometimes hard to work out the story of the history from all the photos and little snaps of information- just seems like they have been invaded by just about everyone in the last 100 years or so). 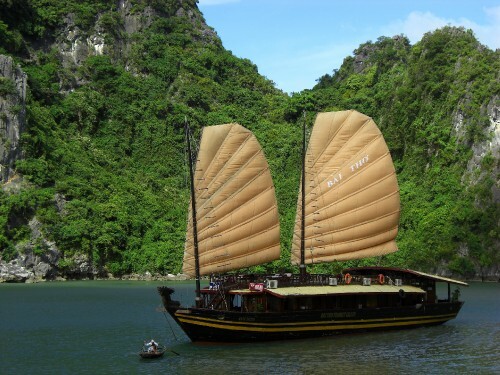 Tomorrow we are going on a 3 day trip to Halong Bay which is supposed to be beautiful and will also be my first visit to a beach since i arrived and i am VERY much looking forward to it, especially as it is just so hot here!